The concentration of signal boxes consists in concentrating 368 existing signal boxes to 31 operational boxes. In addition, 11 locally controlled boxes can also be remotely controlled by one of the 31 final boxes, if necessary (essentially for installations with large sets of sorting sidings for goods wagons). The aim is to enhance safety on the railway network and to ensure better punctuality of trains. Later on, these 31 final signal boxes will be concentrated to 10 boxes spread out over the Belgian territory. With the concentration of the signal boxes the old system will be replaced by an ultramodern electronic system. This means enhanced safety, greater regularity and better information about railroad traffic. The technology used to safely control and monitor train movements is fully computerised. This technology allows for equipment to be controlled at great distance (signals - point switches) within a radius of 10 to 100 km. This contrasts with the traditional signalling stations which were limited to a distance of 5 to 6 km. The new centralised system will be more user-friendly and ergonomic and therefore easier to operate than the older equipment. In addition, train-related information will be analysed in an entirely different way, compared to the past, which will be more efficient. 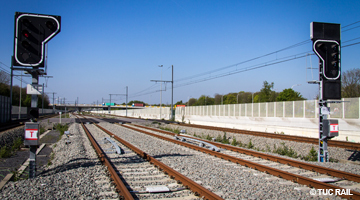 TUC RAIL principally works for Infrabel's Build division, the Belgian railway infrastructure manager. Within Build division the Service Signalling Projects provide project management for this program (budget, planning, risks, etc.). to carry out functional testing of installations. The program covers the entire Belgian rail network and has a large number of intervening parties, which makes for a very complex management. project management during installation and equipment of 17 new signal boxes. Click here to view pictures of the concentration of signal boxes of the Belgian rail network.